declared it would play eight-man football along with Augusta, Episcopal Collegiate Hermitage and Woodlawn. Decatur will play each of those schools twice along with playing the Arkansas School for the Deaf once during the 2018 season. Eight-man football is designated a club sport by the AAA during the 2018 season. As of Aug. 13, the Bulldogs had around 15 players on the roster, which would be dangerously low while playing 11-man foot- ball but around normal size for an eight- man squad. "We had about 14 guys show up over the summer," Ortiz said. "We're doing a lot of catching up right now." The Bulldogs will count on a few upper classmen as they trudge through the unfa- miliar waters in 2018. Cayden Bingham, one of three seniors on the team, is likely to play quarterback for the Bulldogs. "He's going to be a good one," Ortiz said. Senior Austin Hamilton will help in several different spots as will senior Jimmy Mendoza. Junior Javier Perez is probably the stron- gest Bulldog on the roster, Ortiz said, and will play on the line. Junior Lauro Molina helps out on the offensive and defensive lines. The Bulldogs hope to take advantage of sophomore Samuel DeLeon's speed as well. Other team members include juniors Salvador Garcia, Tony Trejo and soph- omores Bryson Funk, Zac Luker, Roger Hernandez, Jose Ruiz, Carlos Hernandez, Demian Merworth and Jetlee Xiong. The switch to eight-man will also be a change in playbook for Ortiz. "I've been calling different guys that have been a part of eight-man football," Ortiz said. "I talked to two guys in Oklahoma where eight-man's pretty big. I've even gotten on YouTube and watched some championship games just to see what kind of offense there might be. I didn't realize it, but there's a ton of websites out there for eight-man football. You can talk to people and look at playbooks and everything. There's a lot of information out there that I've been able to tap into." Offensively, Ortiz said he's looking into two-back sets where the Bulldogs can run lots of option and power football. "There's a lot of things I think we're going to be able to incorporate into an offense," Ortiz said. Defensively, he said, it's going to be tougher. "Defense is a little more technical for us, getting people into the right positions and getting them to move around," Ortiz said. "You can't get away with playing zones." The Bulldogs are set to open their season Aug. 31 at home against Hermitage. They'll play at Hermitage on Oct. 5. Decatur plays at Augusta on Sept. 7, followed by a home game against Episcopal Collegiate on Sept. 14. The Bulldogs play at Woodlawn on Sept. 21 before taking off two weeks prior to playing at Hermitage. Augusta visits Decatur on Oct. 12, and the Bulldogs travel to Little Rock to take on Episcopal Collegiate on Oct. 19. 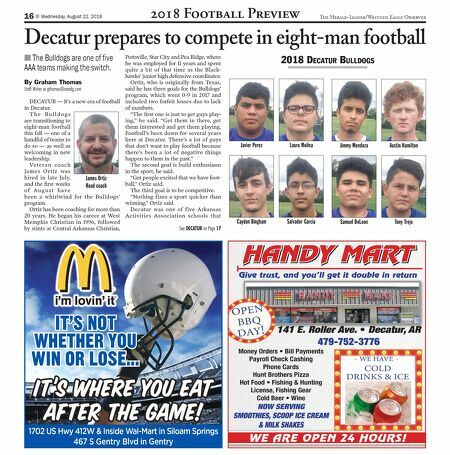 Decatur closes the regular season with home games against Woodlawn on Oct. 26 and Arkansas School for the Deaf on Nov. 2. We're your Shield. We're your Shelter. Jimmy Allen 816 South Mount Olive Street Siloam Springs, AR 72761 479-524-4183 JAllen@ShelterInsurance.com Tackling your Insurance Needs ® Proud to support our local hometown teams! 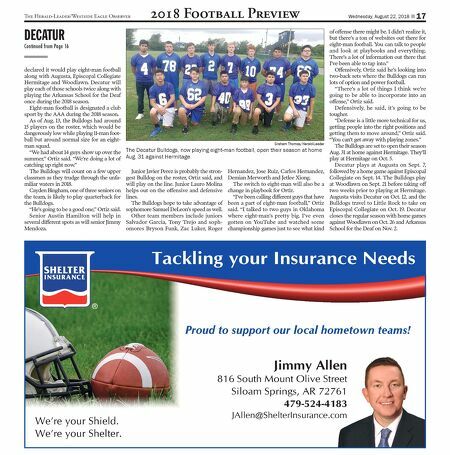 Allen Street 2761 4183 com 2018 Football Preview The Herald-Leader/Westside Eagle Observer Wednesday, August 22, 2018 n 17 DECATUR Continued from Page 16 Graham Thomas/Herald-Leader The Decatur Bulldogs, now playing eight-man football, open their season at home Aug. 31 against Hermitage.